Carl Frampton is set to take on Josh Warrington for the IBF World Featherweight Championship later this month. 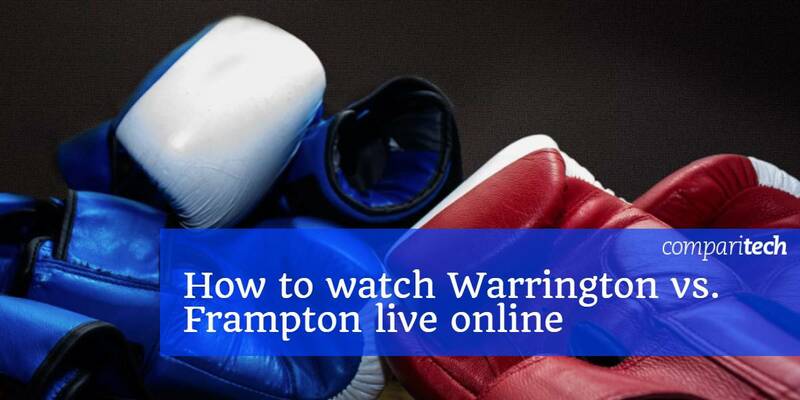 Today, we’ll let you know where you can watch Warrington vs. Frampton live online, which boxer is likely to win, and how to use a Virtual Private Network (VPN) so you can live stream Warrington vs. Frampton abroad from countries like the US, Canada, France, Spain Germany, Australia or anywhere else. This fight will happen at the Manchester Arena on December 22. Notably, ring walks are expected to start around 10PM GMT (1PM PST/ 4PM EST). This means Warrington vs. Frampton will happen at the same time as the Whyte vs. Chisora fight; a decision that has proven unpopular. Below, we’ll explain how to stream this fight and all four of its undercard matches (Heffron vs. Williams, Murray vs. N’Dam, Conlan vs. Cunningham, and Gorman vs. Leapai) wherever you are in the world. This post will only recommend official sources. While there are inevitably unlicensed streams for major sporting events, we advise against using them. To begin with, they often provide an inferior experience, with low resolutions, laggy video, and possibly even a significant delay. Secondly, they’re prone to being taken down for copyright violation, sometimes before the event has even finished. VPNs increase your online security by encrypting it, preventing third parties like hackers, network administrators, or your Internet Service Provider (ISP) from monitoring your activities. However, VPNs are also useful for streaming since you can use them to gain access to geo-locked platforms when abroad. We recommend ExpressVPN: a high-speed service with more than 2,000 servers spread throughout 94 different countries. Further, ExpressVPN can unblock some of the most popular streaming services including DAZN, Netflix, Hulu and BT Sport. Signing up for ExpressVPN only takes a minute: just choose your preferred subscription (one month, six months, or a year) and pay. This service includes a 30-day money-back guarantee, meaning you can essentially use it for free, short-term coverage if you’re going on vacation or want to watch one specific event on a geo-blocked service. Afterwards, you can cancel for a full refund, no questions asked. 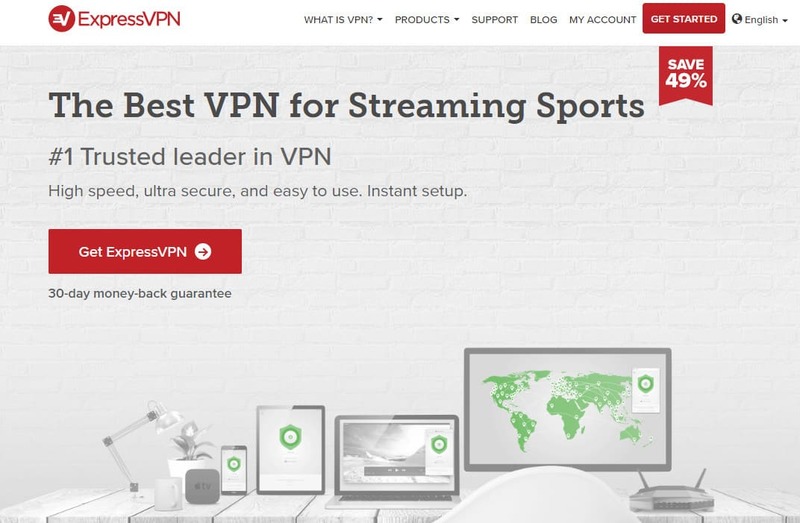 READER DEAL: Get three additional months coverage and save 49% with ExpressVPN’s annual plan. Start by signing up for a suitable VPN. We discussed ExpressVPN above, but NordVPN and CyberGhost are strong, inexpensive alternatives. Download and install the VPN app, making sure to get the appropriate version for your device’s operating system. Connect to one of your VPN’s servers in the source region. For example, you’d use a UK server to connect to access the BT Sport website (see below). Go to the source website and try loading video. It should start immediately, but if it doesn’t, clear your cache and cookies before reloading the page. It’s a good idea to perform the steps above before the fight is due to air. This way, you’ll know in advance if anything doesn’t work the way it should, and will have time to get advice from your VPN’s customer support team. Warrington vs. Frampton will be broadcast exclusively on BT Sport Box Office. At the time of writing, there wasn’t any pricing information available but generally, fights like this cost about £19.95 to watch on the service. It’s worth mentioning that you don’t need BT TV to purchase a pass for this fight, and instead can buy one through your Sky or Virgin Media TV box. However, if you buy a pass via your cable box, you won’t be able to watch online as the Sky Go and Virgin TV Go apps don’t offer BT Sport Box Office. BT Sport requires you to pay with a credit or debit card linked to a UK address. You can choose to add the event’s cost to your EE bill, if you’d like. The good news is that once you’ve paid, BT Sport allows you to watch the fight from any country in the European Union or EEA. Of course, if you’re connected to a VPN, you can be located anywhere. Having difficulty deciding whether to watch this or Whyte vs. Chisora? If you purchased an event pass, BT Sport Box Office allows you to replay it for up to seven days afterwards. Can I sign up for BT Sport Box Office abroad? Passes are not yet available for the Warrington vs. Frampton fight and there are no other events at the moment, so you can’t currently create a new BT Sport Box Office account. However, the service’s FAQ page mentions that you can pay with a British credit or debit card. This means that it’s likely you can sign up and buy the fight pass using a prepaid card. We’d advise caution if you take this approach, though. It’s not uncommon for sellers on online marketplaces to charge you for a code that is invalid, has already been redeemed, or contains the wrong currency. Once you’ve obtained a gift card, just connect to one of your VPN’s British servers and enter the code on the back of the card. On December 22, remember to connect to the VPN again and you should be able to stream Warrington vs. Frampton without any issues. Can I unblock and stream this event with a free VPN? Free VPNs come with several disadvantages that their paid rivals don’t. For instance, free VPNs have limited network sizes and significantly larger user bases than paid providers, which means they’re unable to provide the same speeds. Live streaming HD video is fairly data-intensive, and with a free VPN, you’re likely to experience choppy playback or lag and may even be forced to watch at the lowest resolution, if the video plays at all. Additionally, streaming services frequently block VPN servers. Premium services can usually find a workaround, but free VPNs are often unable to and won’t work. While free VPNs don’t charge you upfront, they are still businesses and have to make money somehow. Often, you’ll find that they place large ads on the pages you visit, but some go even further and store tracking cookies on your device. These cookies enable the service to gather data, such as what websites you visit and how often. This information is worth a lot to advertisers and can be sold off later, most likely without your knowledge or explicit approval. Which fighter is the favorite? Each of these boxers has their own distinct style which, if nothing else, will make this a particularly interesting fight. Warrington likes to play the long game, maintaining pressure and chasing his opponents throughout all twelve rounds. However, he lacks knockout potential. In fact, just six of his 26 wins have come via knockout. Frampton is entirely different. He’s a heavy-hitter who stays close and works the body. Warrington might be fast on his feet but he’d be wise to use his longer reach to keep Frampton at a distance, and if he’s lucky, clinch the match by decision. Frampton is widely expected to outlast his rival, with some pundits predicting a knockout in the later rounds. This would be Warrington’s first professional defeat, and losing the title would hurt even more. Frampton will bring everything he has to this fight: if he wins, it’ll be the third time he’s held a world championship. Whatever the result, this is guaranteed to be a very memorable match.